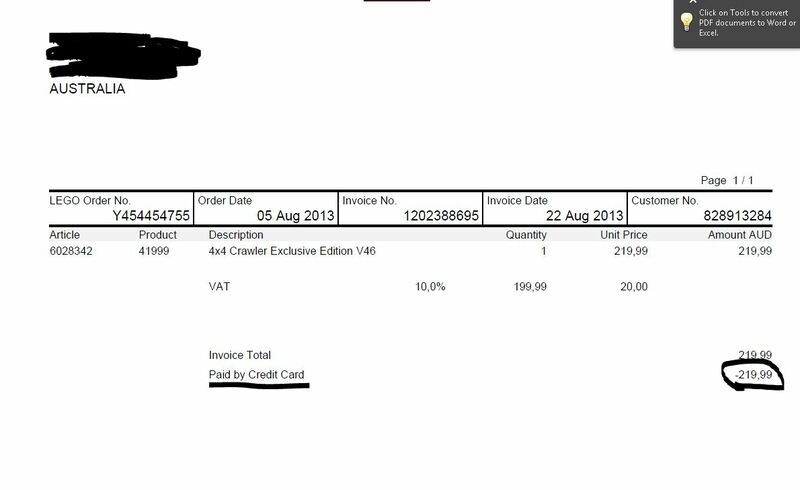 So a few weeks ago I buy a #41999 Crawler from [email protected] Aus, my first [email protected] purchase. As predicted although they were still available they didn't have one in stock and hence they would have to delay the shipping. They say that they'll only bill me when they ship the item, so far, so good. So last Thursday I get the receipt in the image, telling me that I've been billed as expected and that the $220 has been paid by credit card, "amount to be paid: 0,00" it says etc etc. But I look in my bank account and the money is still sitting there. No transaction has been recorded on the invoice date and no money deducted. Nor is it a simple matter of the bank waiting for the payment to clear, on Netbank it tells you what payments are pending and gives you both disposable and nominal amounts. Has anyone run into a similar thing? Anything is possible with [email protected], my problem was that they processed the CC Authorisation and with all the issues I had read about I assumed my order went through fine, it was just the normal delay to get an order number. So some days later I had no order number or history still, so I email customer service to see what's up and get told there is no order and as far as they can see no CC charge etc. A number of emails later including the Authorisation ID I had to get from my bank they said sorry order again. This wasn't possible as #41999 was sold out, after some phone calls they put them on back order for me, which is where they still are and I may never get them. So I'm not exactly happy that a company the size of TLG could have such a sub standard online POS system especially with the kind of profits they make. Huh. Sorry to hear about that. But you said that you called TLG and they told you that there wasn't even an order on file for you? So you never got the email with the receipt of the sort that I attached to my post? No, i got absolutely nothing. I should have contacted them sooner but I had read a bit about orders not showing up straight away etc. and as I had a CC Authorisation for the amount from Lego on my online CC statement, I assumed it was ok and didn't think much about it. Okay, it's been resolved, the money was deducted last night at long last. Anyway, best of luck Basta, I hope one becomes available for you!